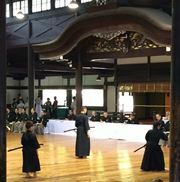 We had Karate practice in Kobe today, starting from 11. Apparently he had won a tennis competition! So we all took a photo together. It's not Karate, but tennis, which is also great. On days that have a number 2, shops open in the evening in smaller towns. Yesterday, I patrolled the streets with some young people and saw shops I hadn't seen in a long time. I remembered the old days. It's Gion Festival here in Kyoto. I have memories of my young brother, so after today's practice I went to see the Hoko float. Yesterday it was ”Tanabata Day ”and we make a wish and write it down in a paper. Yesterday, a boy and a girl, aged 5 years old, told me that their wish was: I want to become a Karate teacher! I take that as a present. The 1st of July marks 10 years since I built the International Karate Sanpakukan. I was able to do this thanks to the support of a lot of people. In Japan, we offer a special fish, Tai (sea bream), to the Gods to celebrate such occasions. So I got one for lunch. 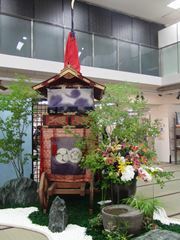 Tomorrow is the first step towards the 11th year of Sanpakukan. 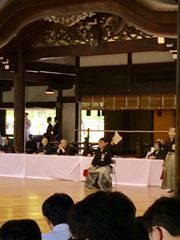 On the 26th of June the Kyoto Prefecture Iaido Competition and All Japan's Iaido Qualifying Competition was held. I was one of the judges at this event.